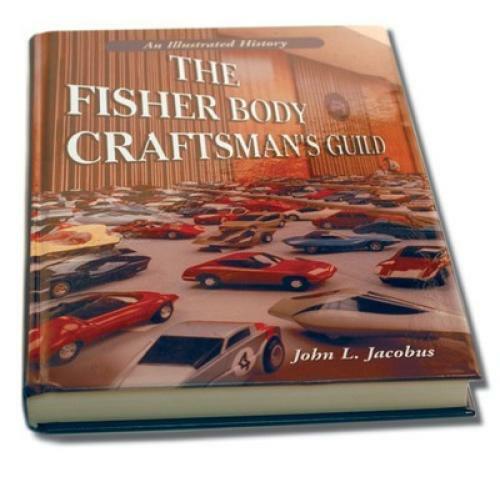 The Fisher Body Craftsman’s Guild was an automobile design competition which challenged boys to design and build a model of their own "idea" for a future car. The competition, conducted annually until 1968, gave boys between the ages 11-19 the opportunity to express their imagination, their design talent, their technical skills and, most importantly, their creative ingenuity in the design and building of a model car. As much fun as it sounds, designing and building a model car took many hours of hard work--thinking and drawing ideas; picking the best one to build; searching for clay or the right block of wood; carving or sculpting their design; constantly refining the 3-D design; making the detail parts including wheels; painting the body and assembling the parts; and, finally, packing the model to ship to Detroit with the deadline looming. This was not an easy task for a young inexperienced boy. But the prizes for the winners were substantial--cash awards for State Winners and college scholarships for National Winners. This is how it worked. After each model was judged by a team of GM Designers and Industrial Arts Teachers, State Winners were notified and given their cash award. Regional Winners were given an all-expenses-paid trip to the 4 day Guild National Convention in Detroit. Nerves were on edge until the Annual Banquet, where, in the presence of prominent Educators and GM Executives, the National Award Winners were announced and broadcast live to anxious parents and friends. Later in the convention, these young designers would spend a morning in the GM Styling Studios talking to professional designers and seeing first hand how real cars were designed. While National Winners go home with scholarships, all the participants go home inspired. 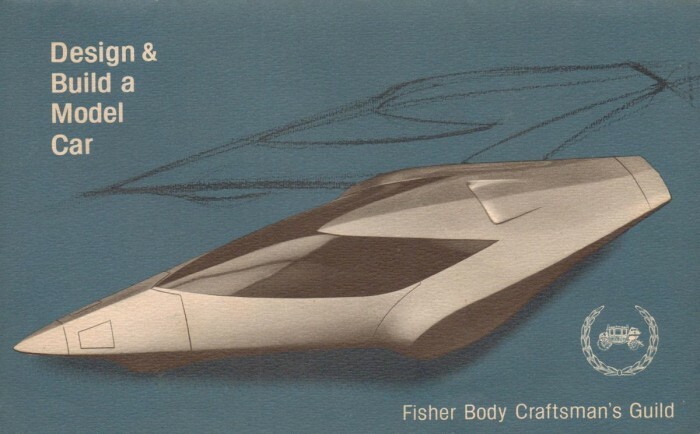 The Fisher Body Craftsman’s Guild began in 1930 as a competition to build a Napoleonic Coach ('pics at right) with awards based solely on craftsmanship. By 1938, with the increasing interest in car styling, the Craftsman’s Guild introduced a new category – designing and building a model car. 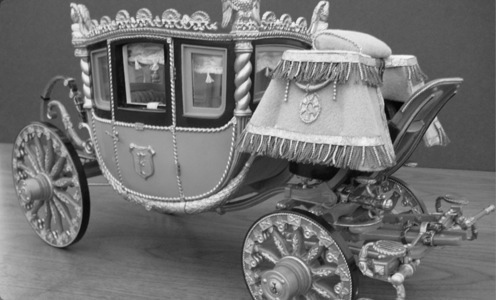 The interest in the car design competition was so overwhelming that the Napoleonic Coach was dropped. By 1968, when the Craftsman’s Guild was concluded, over 8.7 million youths had enrolled over the life of the competition, millions of dollars in Awards had been given and many lives had been touched – some profoundly. Thru the years, the Craftsman’s Guild represented rock-solid values. Young men learned that perseverance was essential and that hard work paid off. They enjoyed a sense of pride and accomplishment that comes from a constructive and positive activity – plus the joy of working with their hands and mind to create their very own design. Many scholarships are given each year to young people with outstanding athletic ability or an outstanding scholastic record. What made the Craftsman’s Guild unique was recognition and reward for young people with outstanding creative ability. Bill Porter, a top GM Designer, now retired, said it another way, "One of the great things the Craftsman’s Guild did for American Design was that it identified talent at an early age so that these young people could proceed to get professional educations. In many fields requiring trained talent, like music and sports, the process of early identification is well established. Not so with design. Many young people with design talent do not learn of the possibilities until they are in college – thus missing out on the valuable skill-acquiring years as a teen when learning comes easiest." The FBCG helped identify and mature a whole generation of design talent. It’s no surprise that many Guild participants, after their formal training, entered the Automobile Industry and dedicated their careers to designing and engineering automobiles. But not all. Some made their mark in Architecture, Urban Planning, Interior Design, Science, Education, Medicine and many other professions. Former Guildsmen who became GM Styling designers, taken in the mid ’70s. Left to right: Paul Tatseos, Jack Folden, Stan Parker, George Prentice, Robert Menking, Charlie Stewart, George Gadda, George Anderson, Stu Shuster, Roy Tiesler, John Wozena, Tom Semple, Chuck Jordan, Kirk Jones, Gordy Brown, Elia Russinoff, Chuck Torner, and Dennis Little. Other Guildsmen who were at GM Styling at the time but not in the photo are Tom Covert, Ron Will, Dave Holls, Galen Wickersham, Al Flowers, Geza Loczi, Ed Taylor, Ron Hill, Terry Henline, Gary Smith, and Bill Scott. Of course, not all the Guildsmen who became car designers ended up at GM. 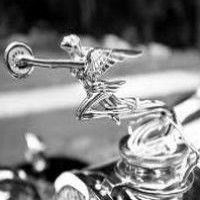 Many of the top designers at Ford, Chrysler, and foreign automakers also benefitted from their mentoring in the Craftsman’s Guild. Chuck Jordan, winner of the 1st National Scholarship Award in 1947 and graduate of MIT, had this to say at the time of his retirement as GM Design Vice President, "I’ve always been grateful for my experience in the Craftsman’s Guild. That experience has paid big dividends. In fact, when I think about it, my life has really been one big Guild Competition, designing and modeling cars, just like I did when I was 19 – except these models are full-size and they compete with the best in the world." Back in, oh, the middle 1960s, I used to enthusiastically tear through (in an hour or less, usually) a pulp-paged monthly called Model Car Science, gazing at the newest glue-brass-and-putty creations of Dave Shuklis and Dennis Doty, passing over the slot-car articles which interested me less. 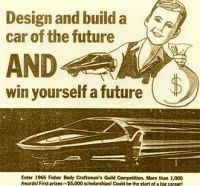 Every year, a major ad would appear in the magazine inviting teenaged car enthusiasts to compete in the Fisher Body Craftsman's Guild, a national competition sponsored by General Motors that awarded scholarships in design to winners who penned and built a unique-looking scale model of a passenger car. This 359-page hardcover book, written by an auto engineer and former Guild contestant, exhaustively examines this unique, ultra-prestigious contest between young would-be design professionals. How big were the contests? An estimated 10 million teens took part in regional and national competitions from the Guild's inception in 1930 until it was discontinued after 1968. It received regular coverage in The New York Times, as well as countless magazines. An estimated 35 percent of the winners were recruited by the Big Three's design studios including GM's great Chuck Jordan, Virgil Exner Jr., who would design the Ford Maverick and Pinto, and Terry Henline, who went on to supervise the design of the stunning 1970 Chevrolet Monte Carlo. Jacobus' work includes interviews with surviving winners, year-by-year results, and reviews rules and techniques for building the one-off models. For someone like me, who dreamed of being part of the Guild as a kid, the book is worth the price. In the end, this was the only model car contest that mattered. Article : par Chuck Jordan & John M. Mellberg.